Parties and Health: Not mutually exclusive! It’s hard to focus on healthy eating and exercise even when you’re in your home environment with nowhere to go and nothing to do. Imagine how difficult it is when you are at parties, events and other social situations. Certainly not everyone is as committed to his or her health as you are. In fact, I’ve learned over the years to never just assume there will be healthy choices available to me. I’ve had to often take matters into my own hands to ensure I get my needs and goals met in all situations. Here are some strategies that have really helped me at parties, work events, galas and the like. Let me know which ones work and resonate for you! Have a meal or snack that you know will fill you up a bit before leaving. Go for a brief walk during the party to take a break from the buffet or hors d’oeuvres. Drink seltzer, water or diet coke during the party. Chew gum (be very subtle here, no blowing bubbles). Dance your booty off, if applicable. Count bites – generally appetizers are 60 calories a bite. “Budget” for your meal – plan for it to happen vs. going spontaneously, i.e. have a smaller lunch and breakfast in anticipation of more calorie dense foods at the event. Bring a high protein snack in your purse to take out if needed, like nuts or a protein bar. Have a friend or spouse keep you accountable to your goals. Potentially arrive late to the party to reduce your exposure to your trigger foods or passed hors d’oeuvres. Put your veggie/fruit radar on and gravitate toward them, get full on them. Have a high movement and exercise day – try to move more than usual to help you budget your extra calories coming in. Choose one food or drink to enjoy at the party (wine, bread, dessert) and fully savor it, eat it slowly, and enjoy it without guilt. Enjoy yourself and congratulate yourself. 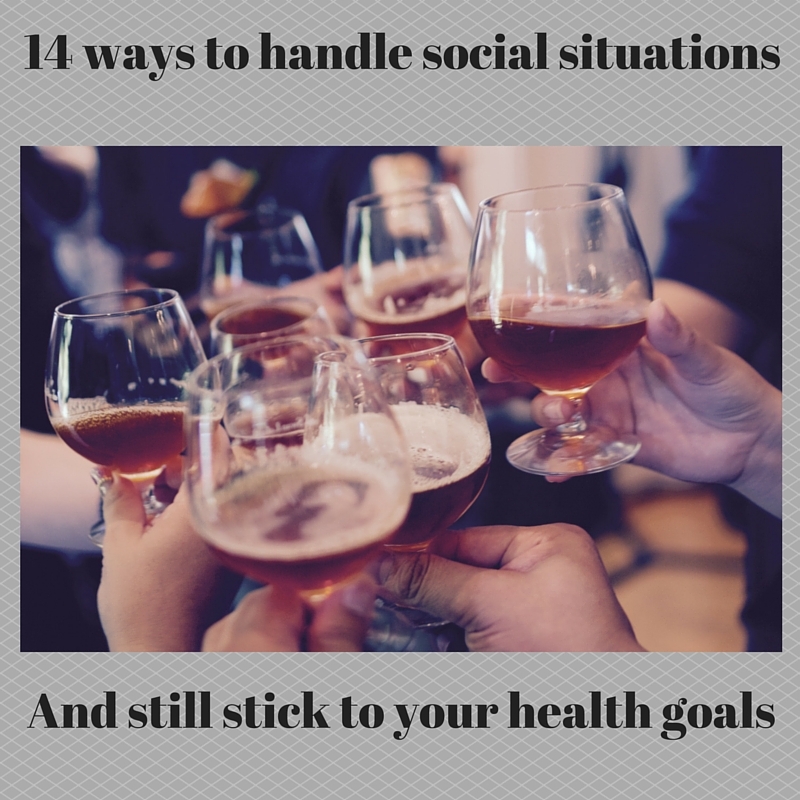 What are some of your strategies to use in social situations to stay healthy and on track of your goals?